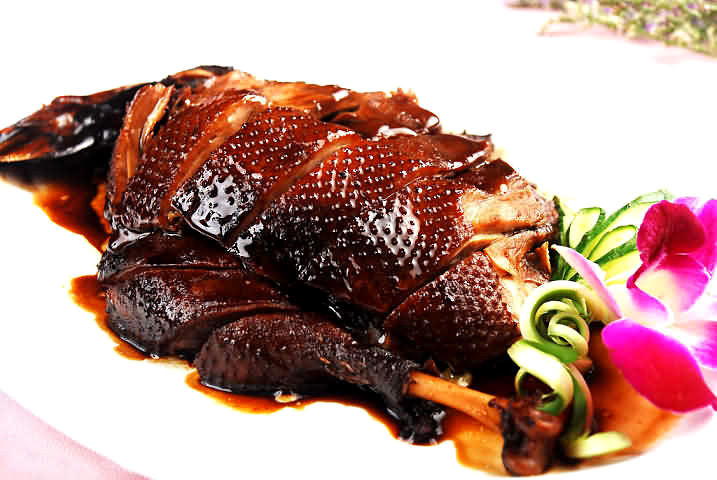 The variety of Kunming cuisine never fails to satisfy hungry travelers. It really is a "crossroads" featuring dishes from all over Yunnan. The feature of Kunming cuisine is a perfect blend of sour and spicy flavors, made from the minority 's century-old traditional recipes. 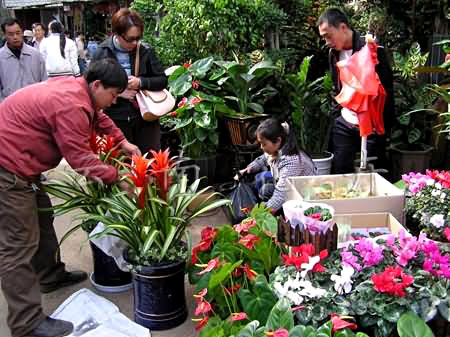 With the high humidity and mild temperatures, there is an abundance of fruits and vegetables all year round easily available throughout the city and often used as the staple for local delicacies. The several hundred types of edible mushrooms are used as side dishes, seasonings, main ingredients, and meat substitutes. Lotus root, peas, bamboo shoots, garlic, onion, and other light greens are also commonly used. 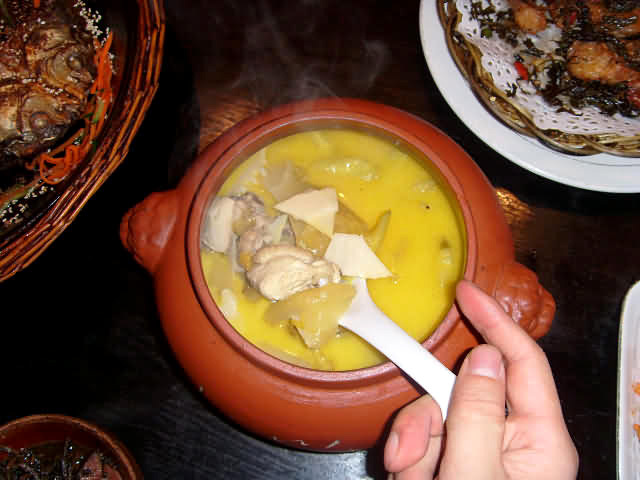 The secret of this famous local dish is the unique design of Kunming 's clay pot: the pot has a shape of water chestnut with a hollow central tube that is the same height of the pot. After chopped chicken, ginger, salt, and other ingredients are added in; this pot is placed in a larger pot filled with boiling water. Then the steam will come out from the central tube to warm the soup in the first pot. In this way, the chicken will be very tender and cooked without damaging its original flavor. 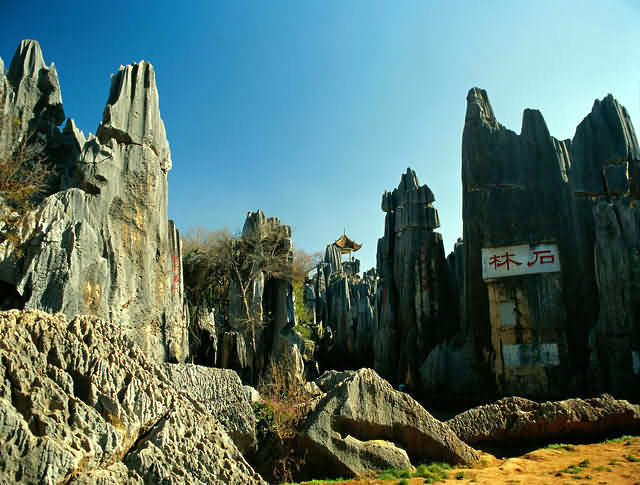 One of the most prized mushrooms in Kunming, jizong is popular because of its chicken-like taste. The following steps are used to make it: Wash it thoroughly; dry by airing; cut it into pieces. Next chop chili and tenderloin pieces. Marinate the tenderloin and Jizong pieces in egg white, starch and salt mixture; then fry in hot oil. Finally, braise the Jizong and tenderloin pieces with garlic, ginger and shallot. Drizzle sesame oil on a plate, place braised pieces on oil. This is a top choice among tourists. Fresh duck from Dianshi Lake is served in a thick golden sauce. Besides its great taste, it is said to be very healthy. 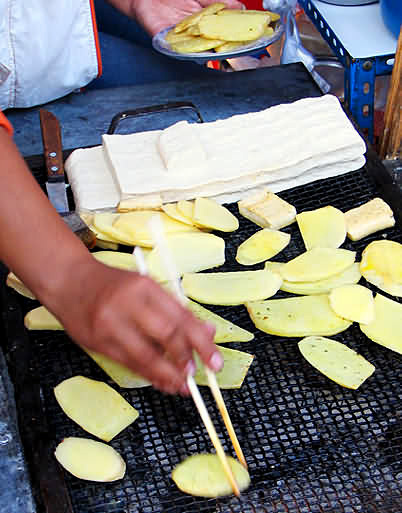 Kunming is also famous for its snack food. After dusk falls, many of the city's big streets and old lanes are lined with food stalls open until midnight. There are a great variety of delicious snacks. You can wander along until you see one you like. 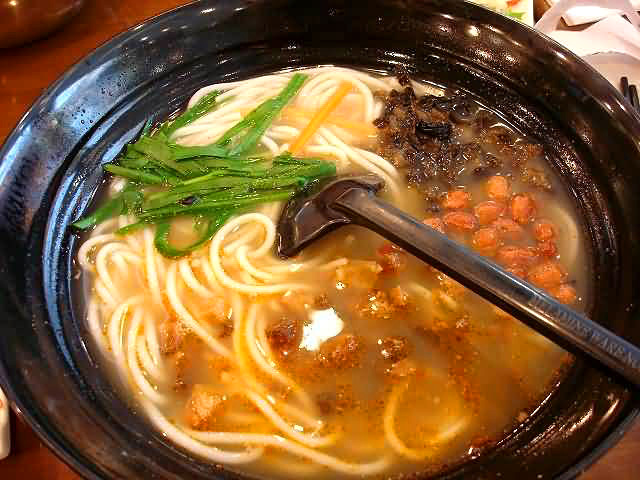 The most famous of all Yunnan food is Guo Qiao rice noodles (literally "Crossing-the-Bridge Rice Noodles "). Rice noodles are made by soaking, steaming and grinding. The process for cooking and eating these rice noodles is quite special. First, make soup with chicken, ham, and bones; ladle the soup in a big bowl, and put some chick fat on the surface. Then heat the fresh meat slices, chicken slices, hams, pig liver slices, fish slices, bean curd, and pea sprouts. Finally, scald the rice noodles prepared in the hot soup and they are ready to eat. Most tables will have plenty of sauces available from which you can pick your favorite kind to add for even more flavor. Produced in Xuanwei County in northeast Yunnan, Yunnan Ham is reputed as one of the three most famous types of hams in China. It features small bones, thin skins, rich flesh, tender meat, fragrant aroma, and beautiful color. The preservatives allow it to be kept for a long time without spoiling. Roasted bean curd is a favorite local snack. It can be bought at the night market, but he best is made in Shiping County and Jianshui County. Made from high quality soybeans, the bean curd smell often turns people off, but many consider it to be quite tasty. Roasted on a steel net by a charcoal fire, and seasoned with spiced salt water, hot pepper powder, and Chinese ash oil, the snack is crisp and fresh. 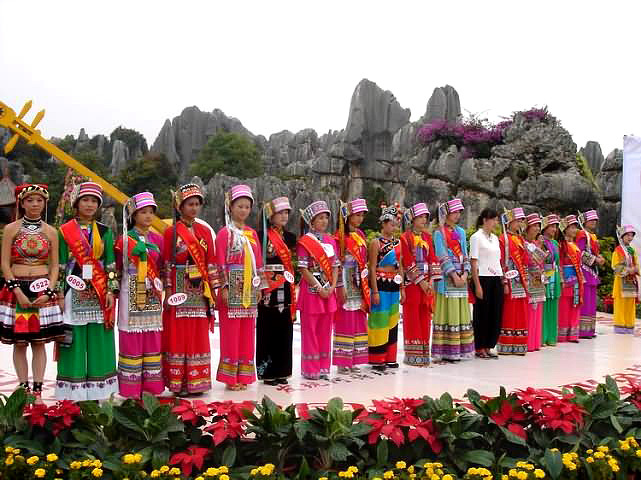 During the Spring Festival, people in Kunming are accustomed to eating rice cakes. Sliced, and mixed with ham slices, pickled vegetables, and hot peppers, before being fried with pig fat and seasoned with sugar and sauce, the rice cakes are a traditional delicacy. They are soft, and tasty. Rice cakes can be fried, boiled, stewed, or roasted and each way produces its own unique flavor. Taste food and beverages from every corner of China as themed provincial restaurants are lined up one after another along this eater 's paradise. Snack vendors dish out bowls full of Guo Qiao Rice Noodles and goat cheese. Relatively few international restaurants grace the area, however, and those looking for some American food or French should check out Cuihu for a wider range of options. 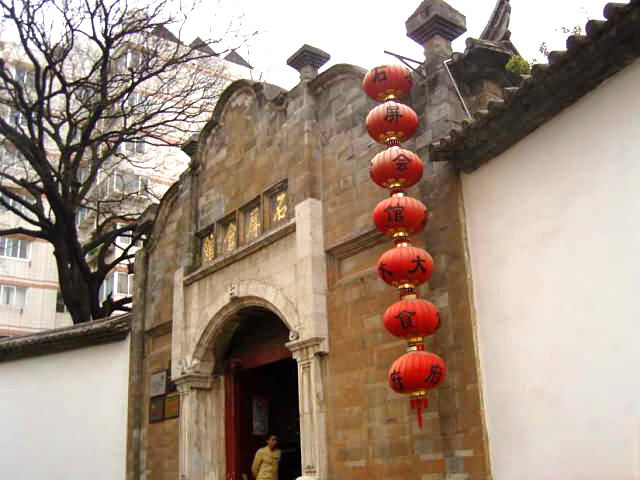 Xingyuan isn't so much a food street as it is a cluster of famous Dian cuisine restaurants. Ten or so well-known Yunnan and minority eateries serve up all the southern Chinese food you can handle. It 's a perfect for those who want to get as much of Kunming cuisine as they can in a limited stay. Once known only for its proliferation of high-end seafood joints, Dianchi Road Food Street has now given birth to a couple of ethnic restaurants that have done pretty well and attracted a lot of diners. AiNi Mountain Villa is an American-owned Dai cuisine restaurant offering tangy dishes that will make your mouth water for more. 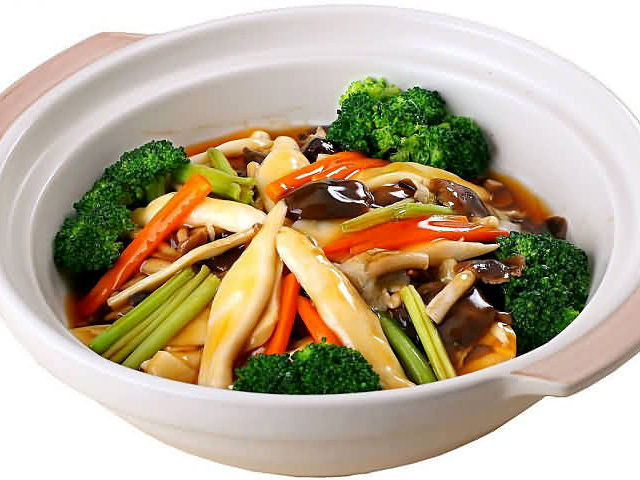 Guanshang is features a fabulous variety of restaurants, each one spcializing in dishes made from wild mushrooms and rare fungi. These dishes are considered to have many helpful medicinal properties. This thriving hotel, dining, and entertainment district is brimming with restaurants from every corner of the globe. Surrounding the aquamarine lake are a number of international eateries serving pizza, salads, burgers, pasta, wine, and coffee. This is definitely the place to go for those who want the familiar taste of home.